Tawada includes to real-life polar bears in her creative book about 3 generations of polar bears. Tosca and Knut are both based off polar bears of the same name found at a German zoo. In fact, Knut is internationally known as the face of climate change. Anyway, the story starts out with the grandmother who is writing her autobiography after being a hit circus performer. Out of all the three, her story is the most engaging. Following her story is her daughter, Tosca’s, story. Instead of seeing through Tosca’s eyes, we see through her trainer’s eyes instead. I found it easier to connect with part two than part one but found the grandmother’s story to be more engrossing. Finally, there is Knut, Tosca’s son. He’s a carefully monitored zoo polar bear, raised by humans until he becomes a danger to his own keepers. Tawada’s story is heavily based on surrealism. The polar bears have access to their own computers and are able to write. They may not be able to verbally communicate, but they make up for it through email or the written word. From circuses to zoos, Tawada forces readers to look at the polar bears as equals. The separation of human vs. animal is made clear in laws that the writer challenges. This novel is highly metaphorical and I feel that I’ve missed a lot. But even if things went over my head, there are obvious things, like seeing laws decide who or what has human rights. It also includes unions and the discussion of worker rights, socialism, and many other political ideologies. From the USSR to exile, Germany to Canada, and back to Germany, readers will each see the political climate of these countries during 3 different generations. Tawada effortlessly includes real-life events into a tale that is almost hard to imagine. But she trusts her readers and if you just go with it, it makes it all the better. Mostly I felt a huge disconnect, even to the grandmother. I found it hard to suspend my expectations, particularly when these polar bears had their own computers (even in their own cages). That’s probably a metaphor. Besides that, it was hard to feel a connection to the characters. Certain themes became too repetitious for me and didn’t flow. And by the third part (Knut’s), I found it hard to pay attention. But I would recommend this book to anyone who likes the surreal. I’ve never read a book quite like this. Jiang writes in a very straightforward fashion which is more telling than showing. I immediately felt a disconnect and found myself often confused and bored with the progression. Instead of feeling in the middle of the action, I felt on the outskirts and couldn’t seem to push past this. Even though the book picks up pace and gets better after the middle, the disconnect remains. 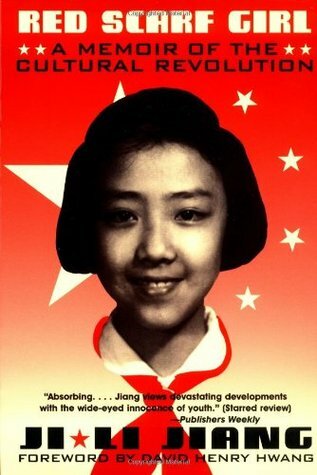 Nevertheless, Red Scarf Girl gives a good glimpse of life during Mao’s Revolution. It’s a time period that I’ve glossed before in classrooms, but never read further than that. Jiang is a young girl who wants to be the best and wants to stand out in Mao’s revolution. She wants to please the government, but with a dark family secret looming, she has more hurdles than most in proving herself and her loyalty. The writing is never quite engaging and I think that’s what really turned me from really liking and diving into this book. While the end part is better, it still doesn’t stand up to other memoirs I’ve read, and that’s why I gave it a 3-star rating. Usually I’d rate it lower, but Jiang includes a lot of global themes, such as finding one’s place in the world, dealing with family secrets, and fighting to survive. Those themes really resonated with me as a reader and perhaps this was the one identification that led me to pushing through the book. If you want to know a personal experience in Mao’s revolution that doesn’t go smooth, you might find this book insightful. Otherwise I would suggest looking elsewhere for a better and clearer picture. Yeong-hye begins having vivid nightmares and believes that the only way to abate them is to become a vegetarian. Her culture is very meat-based in meals and she is quickly judged by the public as it’s very unusual to become a vegetarian if not for strict health reasons. Yeong-hye does not seek to apologize for her choice nor does she try to explain any reasons why. Unfortunately, her decision into vegetarianism is not received well by her husband or her family. The men in her life (namely her husband and father) not only reprimand her for her decision but seek to physically punish her as well. The perspectives Kang chooses are the characters surrounding Yeong-hye. The decision to not give Yeong-hye her own voice in a chapter (although she is given snippets of thoughts) is very important and reflective of the society Yeong-hye lives in. As a woman she is not given a voice and when she finds her voice and exercises her power of control over herself, it’s suddenly an affront to the patriarchal men in her life. Kang’s writing style is brutal and does not shy away from topics of abuse and sexual assault. It’s hard to read at first but necessary as readers navigate the mysterious “why” of Yeong-hye’s choices and our attempts to understand how her life unfolds. What little of Yeong-hye’s voice and perspective readers get is beautiful as it is disturbing. As Yeong-hye seeks to live her life without apology or explanation as is her right, we see her through the lens of her brother-in-law who sexually fantasizes about her. Kang shows how patriarchal cultures automatically sexualize a woman’s body even when the body is not inherently sexual. For instance, Yeong-hye’s decision to not wear a bra is sexualized by her husband constantly and as Kang infers, society. This constant barrage of sexually describing a woman becomes uncomfortable in the first chapter, but readers are forced to see how a personal choice becomes demonized. Socialization can greatly oppress people and in this book it’s apparent with women in particular. One of the most interesting things with Yeong-hye’s turn to vegetarianism is perhaps her constant parallel to ecofeminism. She’s eaten many lives to sustain her without a second thought. She’s eaten animals who had no choice but to die. In the same vein, Yeong-hye has been socialized to follow the rules: to eat meat without question, to wear a bra, to deny herself. In a sense, society is eating her without her expressed permission. The way that a society treats nature and animals around it can also express itself in the treatment of women. Since the rise of patriarchal tradition, culture, and religion, and the decline of the divine feminine which usually coincides with “mother nature” readers see how women are raised in their own slaughterhouses so to speak. Yeong-hye is abused repeatedly without a second thought or a feeling of remorse from the men around her and the women do not take action and stand up for her directly. The cycle is continuous. Perhaps then the only choice a woman has is when and how she is to die. Ultimately Kang writes in a way that you will be thinking about The Vegetarian for a long time. Libya 1979. Nine-year-old Suleiman lives with his parents although his father is frequently out on business trips. During his father’s absence, Suleiman witnesses his mother’s illness flare and listens to her disturbing stories pertaining to the past. One day, while his father is supposedly on a business trip, Suleiman sees him within the city. From that point, Suleiman’s neighbor gets arrested, his father disappears, and a man sits in a car outside Suleiman’s house. The family must do what they can to survive. The writing style of this book is simplistic but it captures so much. Although we are limited to a nine-year-old’s perspective, we witness terrible things innocently. We see Suleiman come to understand the injustices in the world and him coping with witnessing his first death. Suleiman grows as a character within a short span of time. He has to become his mother’s caretaker at times and tries to bring her out of her illness bouts. He comes to understand the injustices women face in his culture. And most of all, he has to grapple with his own evil. From abusing a homeless man to mocking his best friend, Suleiman has to reconcile his actions to himself. When I first began reading this book, I realized that I knew snippets of Libyan history. If you don’t know much about the Libyan revolution before reading this book, take some time and read a little bit about it. It’ll give you better footing and more appreciation for the novel. For all the success Ghaddafi brought the country, there’s always something missing from the narrative, and this book helps fill in the gaps. Overall, a fantastic novel that I enjoyed and learned a lot from. It’s heartbreaking and very vivid, and I think its brilliant that Matar chose a nine-year-old to tell the story. hopefully tomorrow or monday I’ll post a review on Rocket Girls. Summary: One day a girl falls into a hole, except that hole is home to a giant hand emitting a strange turquoise light. An unnamed interviewer begins collecting a team of individuals to begin working on finding the missing pieces of this giant figure and on assembling it. Several things do not add up, including the metal makeup of the giant, the weight, and the light emissions. The team works together to discover its secrets and its capabilities, although not without dire consequences. Reaction: Love. I love the way Neuvel writes this novel. It’s set up on an interview format minus some journal logs, and the dialogue flows so well. It fascinates me that people can write an entire book in dialogue form. The writing style is engaging and it refuses to dumb itself down. The author trusts his readers and the read is deeply rewarding. The cast of characters is diverse in gender and there are plenty of females in powerful positions which in my history of sci-fi books, is rare, very rare. All characters have their own desires and their own respective issues. For a seemingly outlandish book, Neuvel keeps it real with character responses and portraying the human condition in the onslaught of a technological reinassaince. Aside from being a story, it’s much more than that. It asks questions, hard questions. Would you kill in the name of future peace? How many lives are worth this project? Can other countries really work together and not use a weapon of mass destruction for an offensive strike? Are citizens really expendable to governments? Is it right to alter bodies to perform better even if that meant making unethical changes? Do the people involved in bigger-than-themselves projects have a right to make any choices about their personal selves? These are questions that we must ask ourselves as society continues making weapons that remove the human from the physical destruction site. These are questions society and governments must ask themselves: who’s worth losing and who isn’t? Neuvel clearly shows that the western world, while promoting “equality” never really believes that everyone is equal to some. He also showcases a very capitalist point of view: you’re helpful to the government until you’re not, then be willing to get cut from the program and tossed out on your own. The ending is a twist, one I never saw coming. The sequel which comes out in April of this year is a book I’m definitely going to buy. Give it a read and then give it some thought; it’d be a great book to discuss a lot of topics that plague society today.